If more than one Pig goes to the same location, you must share the resources found there, but if you end up alone, you get all the resources from that site. Fable cards allow you to trick and deceive the other Pigs as you all scramble to gather enough resources to build your houses. 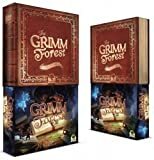 At different points during the game, Friend cards reveal all sorts of strange allies that come out of the Grimm Forest in order to help you meet your goals. The first player to build three houses ( in any combination of Straw, Wood, and/or Brick ) wins the game! 1 Place the three Gather Location boards ( Fields, Forest, and Brickyard ) in the center of the play area, side by side. In a 4-player game, add the Market board 4 beside the other three. With fewer players, remove this board from the game. 2 Pile the Single and Mega resource tokens next to the Gather Location boards to create the Supply. 3 Place a Mega Straw token ( worth 5 Straw ) onto the Fields board, a Mega Wood token ( worth 4 Wood ) onto the Woods board, and a Mega Brick Token ( worth 3 Brick ) onto the Brickyard board. In a 4-player game, place a Single resource 4 token of each type ( Straw, Wood, and Brick ) onto the Market board. 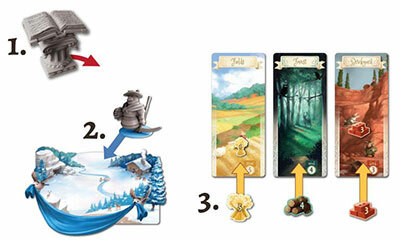 4 Place the three First Builder Bonus tokens at the bottom of their corresponding Gather Location boards. 5 Make a supply of Floor, Walls, and Roof House Sections next to the Gather Location boards. 6 Shuffle the Fable and Friend cards into separate decks, and place them both face down next to the Gather Location boards. 7 Make a supply of the Monster miniatures nearby. 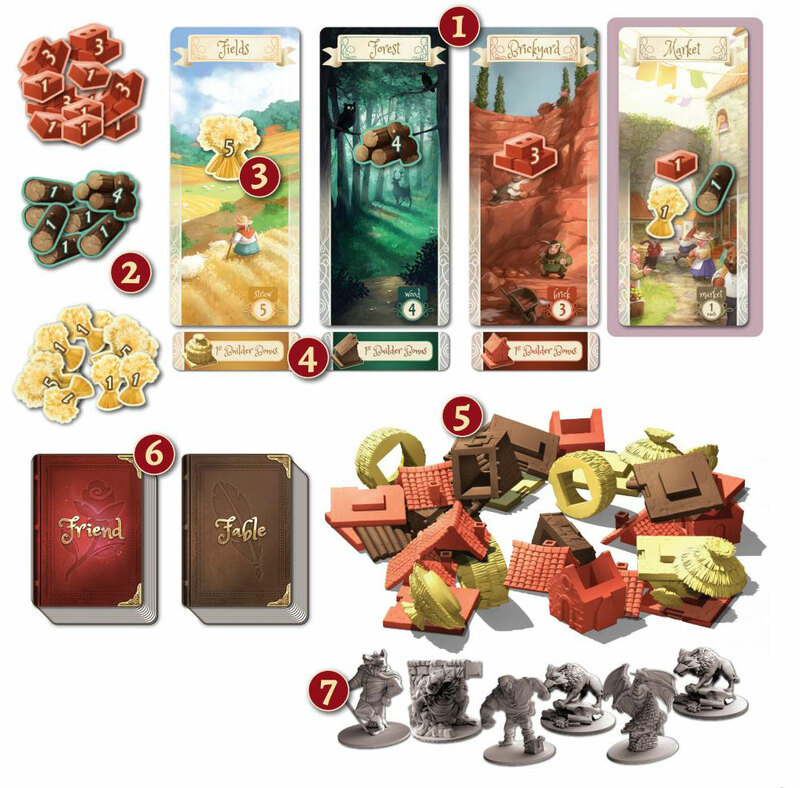 8 Each player selects a color and takes the Player board, the three Gather cards ( Gather Straw, Gather Wood, and Gather Brick ), and the Pig miniature of that color. 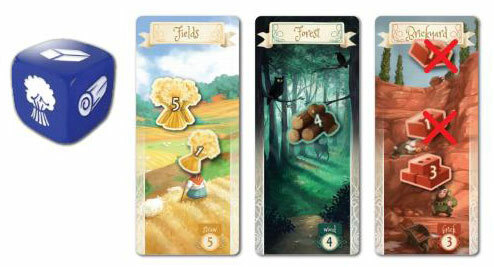 In a 4-player game, each player also takes the Gather Market card along with the other Gather cards. With fewer players, remove the Gather Market cards from the game. Each player also takes a Player Aid card. 9 Give the Starting Player token to the player who ate bacon most recently. You are ready to begin! In this phase you will move to the Gather Locations; there you will gather resources to use in your house-building efforts. Be sure to check for Friend and Fable abilities activating at each step; each card tells you when it takes effect. Reveal all played Fable cards. Resolve Fable cards that activate "When Revealed". Whenever multiple Fable and/or Friend cards would activate at the same time, resolve them in turn order. Also, if any Fable has the icon indicating that it is a Monster , when revealed the player who played it must find that Monster miniature in the supply and place it at any one Location of their choice. Maximum 1 Monster per Location. If more Monsters are played than there are miniatures to place on Locations, place the corresponding card onto that Location instead. Alone: A pig is regarded as being alone if there are no other pigs, even if there is a monster present. Reveal all Gather cards; each player places their Pig in the Gather Location indicated on their card. Then resolve any Fable effects that activate "Before Collecting Resources". If a Pig is alone in a Location, that player collects all the resources in the area. If more than one Pig is in a Location, the resources there are divided equally among all of those players, rounding down. ( Make change from the Supply as needed. ) Any resources left over remain in that Location for the next Gather phase. Resolve any remaining Fable effects, that activate at the "End of Gather Phase". Each player returns their Gather card to their hand. All resolved Fable cards are placed in a face up Fable discard pile near the Fable deck. Some Fables indicate that they stay in play longer than normal; don't discard these ones until indicated. Any Monster miniatures on Locations are returned to the supply. In this phase you will perform actions to gain resources, draw Fable cards , and use your resources to build House sections. In turn order, each player takes one turn. Take the top card of the Fable deck and add it to your hand. There is no limit to the number of Fables you may have in your hand. Collect 1 Single resource of your choice from the Supply. There is no limit to the number of resources you may hold. Build one House section. To do so, pay the appropriate resources by returning them to the Supply, and add your new House section to your Player board. You must use the correct type of resource to build the section; for example you must pay Straw to build a Straw section. Each of your houses must be built in order: Floor, then Walls, then Roof. You may work on multiple houses at a time, but you may not start a new house if you have an unfinished house of the same type. Once you have finished a house, you are allowed to begin a new house of the same type. There are enough house sections to build five houses of each type. Once these run out, you may not build that house section. You may only start a new house if you have an empty Build Site on your Player board; each Player Board has 5 Build Sites. You decide to use one of your actions to Build. You have 4 Wood and 3 Straw, which means you could afford a Straw Floor, or Wood Walls to go on the Wood Floor you built on an earlier turn. (Notice that although you have enough resources to build a Wood Floor, you may not because you already have a Wood house underway). You decide to build the Wood Walls. You pay the 4 Wood back to the supply, take a Wood Walls section from the supply, and stack it on top of your Wood Floor. Some Friend cards permit Special Actions. Each card tells you how its Special Action works. A Special Action does count as one of your two Actions in your Build phase, and you may only perform each Special Action once per turn. It is possible and legal to use one Friend's Special Action and acquire a new Friend and use their Special Action on the same turn. 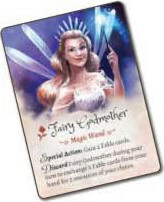 The Fairy Godmother card's Special Action allows you to draw 2 Fable cards... pretty powerful stuff! Friends are characters from other fairy tales who will aid you with special powers. Friends are gained whenever you build walls, and may also be gained by using some Friend and Fable cards, or by taking the 1st Builder Bonus. Each time you gain a Friend, reveal it and decide whether you want to keep it yourself or give it to another player. ( The other player may not refuse it. ) See Friend Cards for details. Each player may only have one Friend at a time. When you get a Friend ( either because you chose to keep one or because another player gave one to you ), you must discard your previous Friend ( if you had one ) and keep the new one instead. Special Actions: Some Friends grant Special Actions. Each Friend's Special Action can only be used once per turn during the Build Phase. It is sometimes possible and legal to use one Friend's Special Action, acquire a new Friend, and then use the new Friend's Special Action on the same turn. You drew a Friend (RUMPELSTILTSKIN) from the deck because you built a Walls section. You already have Goldilocks as a Friend and want to keep her, so you pass Rumpelstiltskin to another player. That player is forced to discard their existing friend and keep Rumpelstiltskin. One Straw, one Wood, and one Brick from the Supply. 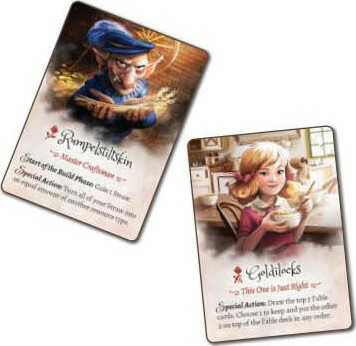 Two Fable cards drawn from the top of the deck. One Friend card drawn from the top of the deck. (Follow the normal rules for gaining a Friend described above). Each First Builder Bonus is only given once for each type of house, even if a house has been blown down by the Big Bad Wolf or some other game effect. In this phase you will wrap up the round and prepare for the next one. Pass the Starting Player marker to the next player clockwise. Everyone retrieves their Pig from the Location boards ( and everyone makes sure they have all of their own Gather cards in their hand ). In a 4-player game, place a Single resource token of each type ( Straw, Wood, and Brick ) onto the Market board. Remember, there were 3 Brick left behind in the Brickyard and 1 Straw in the Fields from this round... with the newly added Mega resource tokens, there will be some bountiful options for Gathering next round! If there is just one player with 3 complete houses, that player wins the game! If more than one player has any three complete houses, the winner is the Pig that built the sturdiest houses. Brick Houses are the sturdiest, followed by Wood and then Straw. The winner is the tied player who built more Brick houses. If that is tied, it is the tied player who built more Wood houses. If two or more Pigs are still tied, the final tiebreaker is the tied player owning the First Builder Bonus token for the sturdiest house type. First to finish any three houses is the winner... but sturdier houses count for important tie-breakers! Tie Breaker example: The Orange player has built 2 Brick Houses and 1 Straw House. The Blue Player has built 1 Brick House and 2 Wood Houses. Orange built more Brick houses, so Orange is the winner! In the 2-player game, a neutral player named Prince Regal is added to the game. Each turn he will take half of the resources from one of the Locations for himself, in order to store up supplies so that one day he can move out of the Royal Palace and create a smaller Palace of his own. During Setup, place the Prince Regal Resource Die next to the Gather Location Boards. At the start of each Gather phase, roll the Resource Die. The Prince immediately collects half of the resources from that Location ( rounding down ); return the resources he collects to the supply. Both players then choose their Gather and Fable cards, and play proceeds as normal. If any Location has more than 10 resources on it, Prince Regal does not roll, and instead automatically takes from the Location with the most resources. If more than one Location has more than 10 resources and they have equal amounts, Prince Regal prefers Brick first, then Wood, then Straw. Prince Regal is not considered to be "at" the Location he takes from; therefore he does not affect Fable cards that specify if a player is alone or not, and he does not get caught by Monsters. Prince Regal example: At the start of the round, the Prince Regal die is rolled, and it shows Brick. The Brickyard Location has 5 Brick on it. Since half of 5 rounded down is 2, Prince Regal's 2 Brick is returned to the supply, leaving 3 behind. 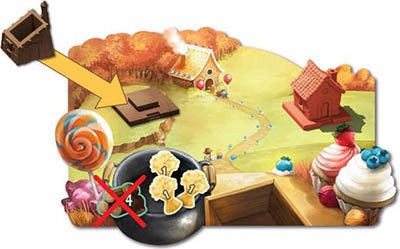 The rules for the 4-player game appear throughout the rulebook, but are gathered here for your convenience as well. All of the 4-player rules concern the addition of the Market Location to the game. During Setup, lay out the Market Location with the others ( with one of each resource on it ), and make sure that each player has their Gather Market card in addition to their usual three. The Market is treated like any other Location. If multiple Pigs end up in the Market during the Gather phase, the resources there are divided by drafting. During the Cleanup phase, place 1 of each resource ( Straw, Wood, and Brick ) into the Market, adding to any resources remaining from the previous round.